Buying a top rated snow blower doesn’t need to be hard. From small electric snow shovels to commercial gas-powered snow blowers, we review them all. Below you’ll find our best gas powered snow blowers, but be sure to use the main menu to find the right machine for you. The Husqvarna ST224 is a little brother to the Husqvarna ST224P, which comes with power steering and other fancy bells and whistles (but for more money). The ST224P has been a bestseller on Amazon for two years and is currently the best rated snow blower available. It is capable of handling virtually any amount of snow, and is perfect for clearing out 2-car driveways. The Husqvarna ST224/P are both able to run on concrete, grass, and gravel. However, the ST224 does not come with power steering, whereas the ST224P does. It is up to you whether or not the extra investment is worth it for the luxury. The Craftsman 88173 Snow Blower is a good all-around machine, perfect for clearing driveways and patios and for use on gravel, and we like it a lot. It is compact and simple to use, well-designed and efficient but does lack a couple of features that other models offer. The major factor in its favor is perhaps the price: you can find this model for under $700, which puts it a good way cheaper than some of its 24-inch rivals. So, why is the Cub Cadet 524 SWE one of the snow blowers that we would put on our shortlist? 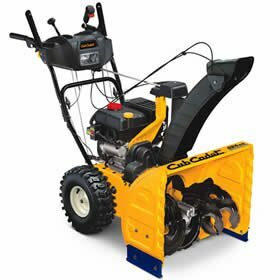 Quite simply, it is a compact and powerful machine, one with proven attributes (as with most Cub Cadet snow blowers), that is reliable and that comes from a known manufacturer, and it does the job it is intended for with very impressive results. It’s made by MTD, who are one of the most prolific and regarded manufacturers of these machines, and as such comes with very strong credentials. The Toro Snowmaster 724 QXE is one of the most best rated snow blowers on the market. While its price point is great given its quality, it does have a few drawbacks compared to some of the other blowers on the list. Most notably, while it handles smooth surfaces like a pro, it struggles when it comes to gravel and other rough areas. While it is possible to move snow from rough areas with the Snowmaster 724, it is recommended to look at other options if you are going to be in that terrain frequently. The Toro Snowmaster shines on flat surfaces like parking lots, driveways and sidewalks, however. It is fast, throws snow far, and can handle 2-14 inches of snow. Arien’s has a great reputation among consumers across North America. A simple scan of reviews online and you’ll see that the gas snow blower reviews for this model are rarely from disappointed customers. 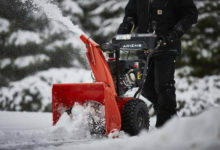 The Ariens compact 24 inch snowblower can handle moderate to heavy snow conditions without breaking a sweat. A 24-inch clearing path means people with large driveways or a lot of sidewalks can get the job done quickly with the least amount of passes. 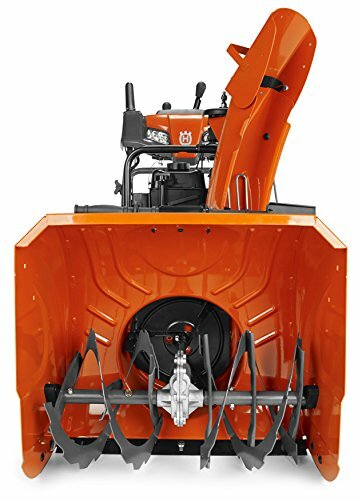 Not all snow blowers are built the same and this is certainly true for the Ariens Sno-Tek 920402 snow blower. For under a thousand bucks, you can get a heavy duty machine that is as reliable for average snow loads as well as heavy snow loads. Overall, if you’re looking for an affordable heavy-duty machine, be sure to consider the Sno-Tek 920402 by Ariens and you won’t be disappointed. The Husqvarna ST230P is a 30” inch two stage snowblower that can handle snow loads up to 16 inches without breaking a sweat. If you live in an area that gets low to medium loads of snow or the occasional dusting, this snowblower is perfect for you and will perform at it’s best. This snowblower is easy to operate and fairly easy to get up and running with quickly. With a wide 30″ clearing width, you’ll plough through snow and be on the road in no time at all. What Is A Snow Blower and How Do They Work? Do You Need The Latest Top Rated & Best Snow Blower in 2018? Which Is The Best Snowblower for You? Winter is a beautiful time of year – to look at! The wonderful snow-covered trees and pretty houses we see on Christmas cards are very attractive, but it is a month that also comes with some serious downsides. One is that it can be extremely cold. Nobody likes to go outside in sub-zero temperatures, yet it has to be done if we are to go to work, get the kids to school and go about our daily lives. The romantic image of a family tucked up in front of a roaring fire, the cold kept at bay outside, maybe one we all wish was a reality, but in fact, things can be very unpleasant indeed! Picture this scene: it’s early morning in December, middle of the week, you get up to get ready to sort the kids out and get yourself to work, and there’s been a heavy snowfall overnight. Your drive, path, and lawn have all been covered, the roof needs clearing of snow – what’s more – the snow plow has been through and has left a nice pile of snow at the end of your drive! In addition to making breakfast, getting everyone ready and getting yourself to work on time, you now have to clear the drive and paths to make it safe and to enable you to get the car out. It’s no fun in the dark, on a cold and damp winter morning when you want to just get in your car, turn the heater on and go, to have to get the snow shovel out and dig yourself a path, but it needs to be done. This is the other side of winter, the one that they don’t show in films and pictures, the one that is real and not very pleasant at all. So, what can you do to make it easier? After all, there’s nothing any of us can do about the weather, as it is always going to do what it wants to! The answer may be to buy the best snow blower on the market, a great piece of equipment that you will not regret owning at any point. Now, you may be wondering why you really need the best rated snow blowers, and whether this is, in fact, an expensive folly that you can really do without. 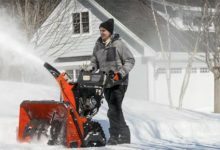 When we explain the benefits of a top rated snow blower – and what they can do for you – we believe you will want one straight away, so carry on reading our best snow blower reviews and let us show you how, for a few hundred dollars, you can save time and energy in the coldest months with a snow blower. A snow blower is a machine that, once you have bought and used one, you will wonder how you did without! It’s a simple concept that involves a device designed to move snow from one place to another; unlike, say, a vacuum cleaner or lawn mower it does not carry the snow, but blows it physically out of the way, thus clearing the obstruction. Click here to learn more about how snow blowers work. There are many different makes, models, and types of snow blowers on the market, so we will talk you through what you need to know and look for when buying one. You should also check our snowblower reviews, as we have looked at many of the top models so you can see which one is best for you. Most snow blowers are petrol-powered, are easy to use (especially small snow blowers), and have many features that enable them to do the job you want. The best snow blowers 2018 are designed to be easy to handle and are very versatile, pack a sensible amount of power, and can shift a great area of snow in a very short time. The advantages, then, should be clear, but we’ll look in more detail at whether you need one right now. Do you live in an area where you experience mild to heavy snowfall in the winter months? Many areas do, and it can be very difficult to keep things moving on a day to day basis. You clear the snow away one morning, it snows throughout the day and overnight, and you have to do the same again the next morning. This happens day after day, for long periods of the winter months, and you get tired and cold every morning before you go to work. You might think that shoveling the snow to one side with a snow shovel is the easiest – and cheapest – option. It is certainly cheap, but it is far from easy. You might have experienced a foot or more of snow overnight; that’s a lot to move if you want to get your car out, and a massive amount if you are doing it by hand! Then there’s the neat pile left by the snowplow; it’s your responsibility to move it, as all they have to do is make the roads passable. All that shoveling, every morning, for most of the winter – you’d really rather not, wouldn’t you? That’s why a snow blower is the best solution! These excellent electric snow shovels and gas snow blowers are easy to use and are not at all expensive (especially when you consider the time and effort they will save you) plus you never have to worry about shoveling snow again! No more aching back, no more having to get up extra-early to get the drive cleared – just a few minutes of your time with a machine that will not only clear as much snow as you need but will also tackle that pile at the end of the drive! We’ve built such a large collection of snow blower reviews that if you can’t find the perfect model here, then you’re looking for the wrong thing! It’s worth noting that snowblowers are available in a single stage and 2 stage models, so if you’re looking to find the best single stage snow blower then keep an eye out on our reviews as we also specify if it’s single stage snow blower or 2 stage. If you have deep, heavy snow then you may find that the best 2 stage snow blower is much more suited to your needs. All you need to know now is what to look for, and which one to buy, and that’s where our snow blower reviews come in handy! We have picked the very best snow blowers available that are suitable for domestic use, but before you head across to our snow blower review section, here’s a bit of info on what you need to look for when buying your snow blower. The size of the machine you buy is important as you want one that can clear your required area quickly and easily. It doesn’t matter whether you have a large area of driveway, paths, patio, and garden that needs clearing, we recommend you choose a machine that is at or above the standard size, which is 24-inches. These models give you plenty of scope for approaching large areas safe in the knowledge you will get the job done, and do so very efficiently and effectively, too. By reading customer reviews and looking at the different snow blower ratings, you should be able to make an educated guess on whether or not the particular snow blower is the best for what you need. Many of the top rated snow blowers on the market are either suited towards low snowfall areas or heavy snowfall areas, so it’s important to read the customer reviews to see what type of work they were undertaking. Most of the best snow blowers, and many featured in our reviews use a 208cc engine that is pretty much the standard. It is a tried and tested engine that offers more than enough power and torque to drive a snow blower through some serious depths of cover and is known to be extremely reliable and to require very little in the way of maintenance. We strongly recommend that you choose a model with this engine – a neat and very effective design – as you get the peace of mind that it will work when you want it to. There was a time when machines of this type had to be started by the old pull-cord method, much as you would a boat engine. In the early hours of the morning, with the snow coming down, you want a snow blower that starts quickly and easily – and the first time, every time – so look among our reviews for those that have push-button electric starting. This will save you a lot of time and effort on those freezing mornings, and you will know you have a machine that is going to work every time you need it to. Our snow blowers reviews will always point out which snow blowers have an electric start as so many people prefer models that do. Of course, you could also just look to buy an electric battery powered model instead, we’ve just released our Top 5 Best Cordless Battery Powered Snow Blower Reviews for 2018 and 2019. Some models are single speed, but most of those we have included in our reviews feature a number of forward and reverse gears. The most versatile will offer you six forward and two reverse; this gives you the best selection of operating speeds so you can tackle any snowfall or drift at your own pace, and also means you can clear the more troublesome areas with ease. You’re going to be using your snow blower in some pretty heavy conditions, so you need to make sure you have the one that is easiest for you to use. Many of the models that we have reviewed have power steering – some do not – so it is worth checking them out to make sure they are going to be suitable for you. Look for the ones that have single-hand control, too, as they make it easier for you to make adjustments (see below) without interrupting your work. Machines without power steering should not be written off, however, as they can still be useful for people with only small areas to cover. 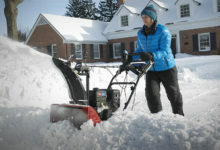 There is little point in having a snow blower that can only manage an inch or snow; you need one capable of coping with small drifts – and the pile left at the end of the drive – so look for those that offer 21 inch or more in terms of how deep they can clear. Most of the best models do, so you should have no problem. There are certain adjustments you need to be able to make to your snow blower; you need to be able to change the direction of the chute, so you can clear more efficiently, and you need to have an adjustable handle so that different people can use it comfortably when needed. The above are some of the main features to look for in when buying a snow blower, but there are a couple more we thought we would mention before we move on. The first is that only some of the models we review come with headlights: we think this is an important feature, as you will undoubtedly be using your snow blower in the morning and in the dark, so we recommend you look for a model that comes with lights either as standard or as an optional extra. Also, a heated handle might also be a nice touch, and yet only a few machines we have reviewed offer this option. It’s a help on those cold mornings when you need to clear a lot of ground! One other thing that we should mention here is cost: you need to spend a few hundred dollars – anywhere between 600 and 1000 – to get the best snow blower for you, but bear in mind that, for that money, you get a machine that you will use again and again. That will mean you no longer have to use a spade early in the morning, that will do the job quickly and effectively, and that will cost you very little to run and need only the very basics in terms of maintenance. In short, if you have even the smallest area that gets affected by snow, a snow blower is the answer, and you will not regret it. We hope that our snowblower reviews have made it easier for you to discover the best snow blowers on the market to fit your needs among the many on the market and that the above guide gives you an idea of what to look out for. These machines all do the same thing but, as with everything, some do it better than others! We recommend you set your budget, check our reviews and see which one comes out on top in terms of what it offers you and how it can help you clear snow when needed quickly and easily, and you will have a much more comfortable winter every year.